This is a bit more of a fluff piece rather than a War Domain Cleric build. If you’re looking for character builds check out this page! I’m playing a Dragonborn Cleric in my friend’s 5e campaign. This is the group of friends I had only just introduced D&D (3.5e) last semester, so they did not have a great grasp on the classes and role-playing. The campaign was pretty bare-bones. Primarily because a) I was rusty as hell and b) it’s very hard to teach 6 people at once. This time is different though, especially since 5e is honestly just a hell of a lot better as far as character creation goes. Regardless, the friend that is DMing this campaign played a Cleric in my campaign. However, all he did was heal bot and occasionally pull out a mace and hit things. It’s cool if that’s your jam, but he offhandedly mentioned one time that Clerics were rather boring which set off a superiority complex for me as Cleric is one of my favorite classes in D&D. What do I do? Well, I planned to make a War Domain Cleric that would rival my roommate’s newly rolled Barbarian with… really good stats. By default, Clerics are magic users that have a divine connection with some god. There are many different specializations you can choose at level 1 each granting different spells, class abilities, armor/weapon proficiency, etc. For the most part, your two main stats are going to be your spell casting stat, Wisdom, and your concentration save and health pool stat, Constitution. These two are generally your top priority for your basic Cleric. Depending on the weaponry you are using you may want Strength or Dexterity if you are using a finesse melee weapon or a ranged weapon. Charisma is also really nice for just talking your way out of things, and of course, Intelligence is great for you to know, just basic knowledge of the world around you and your religion. Where does the 6 go? The first 13 should be in CON. It’s my second highest roll and my second-most important stat. There are a lot of channeled weapon bonus spells that I would need to make a concentration save on in order to continue casting them. Since I’m in the front line I’ll get hit quite often and will need to succeed many of these. Plus I don’t feel like dying. As a Dragonborn I get a +2 bonus to STR this means I can throw a 13 into STR and do some decent damage, which is my goal with this character after all. At this point, the Barbarian won’t have anything on my damage. I’ll throw a 13 into CHAR, plus as a Dragonborn I get a +1 to CHAR. I want to be able to speak well. (Note: this is where it goes downhill) Plus I should be preaching the word of my god, can’t be doing that with a low CHAR. Now I get to choose between an 11 and 6 between DEX and INT. I’m going to eventually be in heavy armor anyway so putting one of the higher stats into DEX would’ve been an absolute waste (saving throws are for people without full plate). Intelligence is crucial though. A low intelligence person would not be able to critically think, and someone with a 6 INT would be VERY below average. At the end of the day though, I’d rather not have negatives to my Armor Class so I’ll keep my DEX at 11. To answer the question, the 6 went to INT. It could’ve been avoided if I was fine with being ugly and an absolutely awful speaker, but at the end of the day I’d rather be stupid and good looking than smart and ugly. Admittedly I’d rather just be neither, but hey. How do I with play a character with low intelligence? I wanted to get the group more into role-playing this semester as well, so I needed to edit my backstory a bit. We’re all a bunch of awkward engineering/science students so this should be fun. Yonzhul Dathkor of the Firewalker Clan was a soldier in the Firelance corpse which was a guard unit in the clan’s military. One day humans came and caught Yonzhul by surprise, taking him captive and possibly slaughtering the rest of his people. He doesn’t know, he was the only guard in that area and could not warn the others in time. During his captivity Yonzhul was beaten and tortured and suffered a microfracture (learned that fancy word from my biomedical engineer roommate) in the front of his skull, severely damaging his frontal lobe. For those of you that don’t know, the frontal lobe is the part of your brain that controls short-term memory and a ton of other important functions. So rather than play Yonzhul Dathkor of the Firewalker Clan as an idiot as I would assume most people’s approach would be. I decided that I would make him a man that has unfortunately suffered such a tragic memory loss and all he wants in life is to return home and hopefully see his clan safe and alive. But he has no idea if they are. All he knows for sure is everything that happened prior to his capture. The main problem I ran into in role-playing so far is wisdom vs. intelligence which I might just make a post on my interpretation soon. 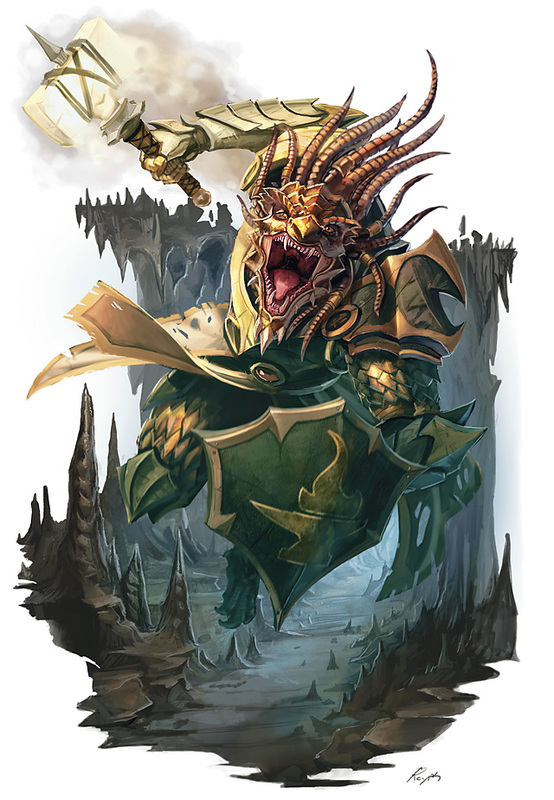 For instance, the DM attempted to rip Yonzhul off when he was trying to purchase a weapon. Yonzhul did an insight check and realized that the shopkeeper was lying to him about his “fair” prices so he decided not to buy from him. The rest of the group questioned why I wouldn’t just buy the shiny axe since I have 6 INT and am therefore a literal numb skull. Yonzhul does not know how the axe was forged. He does not know how currency has an economic value. What Yonzhul Drathkor of the Firewalker Clan does know is a liar when he sees one and knows that his money is worth SOMETHING he is just not sure WHY it is. Low intelligence forces the character to rely entirely on instinct. Maybe a person being smart or dumb can’t be measured by a single metric after all? If only we had a test. A test for intelligence. Maybe a smarts quotient, or some such… But all joking aside, I’ve made similar arguments with players who think I should do the moron voice when INT takes a hit. Great topic to broach.